Michael Jordan shoes are a classic of the footwear world. 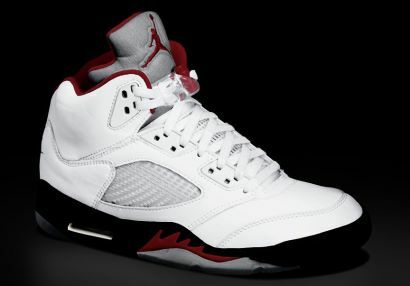 Here you have information and pictures of the Air Jordan V (5). Click image to enlarge it. Michael Jordan wore the Air Jordan V (5) in the 1989-90 NBA Season. Noting the similarities between MJ's circle-then-attack game and an aerial dogfight, designer Tinker Hatfield draws inspiration from the WWII Spitfire as seen by "flames" on the shoe based on the fighter plane's paintjob. The clear rubber sole with Jumpman underfoot, iridescent reflective tongue and plastic lacelock toggle combine in a classic shoe worn by MJ as he elevates his game into the clouds. The extraordinary has become commonplace as Jordan leads the league in scoring (33.6 ppg) and steals (2.77) once again. Raising the bar to the rafters, MJ pours in an unbelievable career best 69 points against Cleveland in a 117-113 overtime win. He also starts his own long distance plan, increasing his 3-point efficiency by 100% and hitting 92 treys, compared with 68 in his first five combined season. THe All-Star, First Team and First Team All-Defensive mega-star averages 36.7 points in 16 playoff games, defeating Milwaukee and Philly in the first two rounds, but losing once again to hard-hitting Detroit in the Conference Finals.